Here is a song in lounge style (by the Dutch musician Eddy de Clercq) performed (in 2002) by the famous Dutch actress, model and on occasion singer Sylvia Kristel. Sylvia Kristel was born in 1952 in Utrecht, Netherlands. In 1973 she entered the Miss TV Europe contest and won. She gained international attention in 1974 for playing the title character in the film "Emmanuelle" which remains one of the most successful French films ever produced. Kristel found herself typecast as Emmanuelle and often played roles that capitalized upon that image, most notably starring in an adaptation of "Lady Chatterly's Lover", and a biopic of World War I spy, "Mata Hari", in which she played the title role (following Greta Garbo and Marlene Dietrich). She played in several movies, some of them showing her sensibility and talent, such as the excellent, unjustly unknown French film "Alice ou la dernière fugue" ("Alice or the Last Escapade" in the USA), in 1977. Her Emmanuelle image followed her to the United States where she played Nicole Mallow in the controversial 1981 comedy "Private Lessons". She continues to appear in movies, and last played Emmanuelle in the early 1990's. 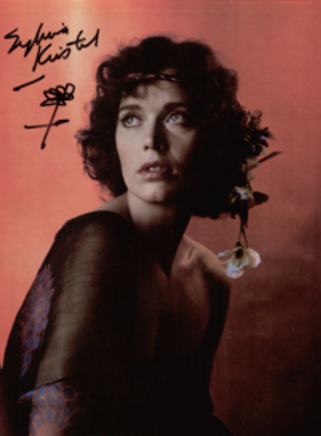 Sylvia Kristel also sang the score of "Emmanuelle 2".